First of all, yesterday started as a good day: the first day of my winter break. I spent all morning doing laundry, vacuuming, washing the pile of dishes that had accumulated in the sink, cleaning the countertops, relocating library books to somewhere that is NOT the kitchen table…all incredibly satisfying tasks when you’ve been unable to tackle them due to that whole limit on the number of hours in a day. Anyway, I went to get the mail, and found an incredibly festive package waiting for me: part 2 of the blogiversary prize I won from Jodi over at A Caffeinated Yarn. 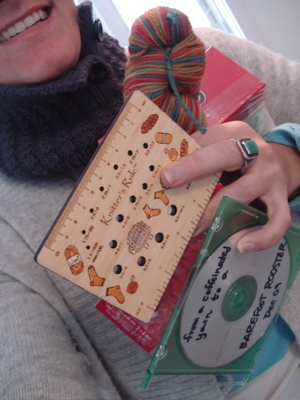 A mix cd (which I listened to several times yesterday), a knit counter, a box of holiday tea (which is quite tasty, by the way), a gorgeous skein of Mama Llama DK sock yarn in the Earth colorway, and a needle size/gauge ruler that is absolutely adorable. I feel like Christmas came early. Thank you, Jodi! Yesterday included even more to celebrate! My dearest friends from my old home greeted their first child yesterday: a boy! His mom is the first person I taught to knit. I decided that I wanted to spin for this baby, and I told her that I was waiting to cast on to find out if the newest member of the family was a boy or a girl. She texted a few hours after the birth (mighty impressive!) to tell me I could start knitting! And knit I did. I am so pleased with what I made yesterday (the first of many gifts for Chunk), but I don’t want to ruin the surprise. 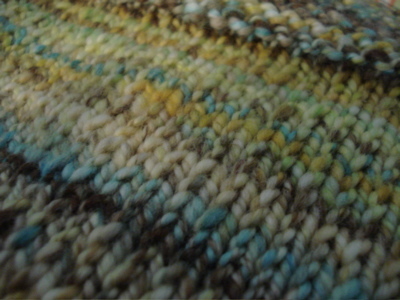 Here’s a close up of the knit fabric. After seeing some fantastic photos of Chunk’s nursery (which, ahem, used to be my room!) I decided that the skein of FLUFF sw merino in Beach Day was, in fact, perfect. Yesterday also involved a knitting date with friend K, and a carrot souffle! Today: more holiday knitting, yoga, and a nice walk with Boh. Happy weekend, folks! This entry was posted in kitchen, knitting and tagged a caffeinated yarn, baby, beach day, blogiversary, carrot souffle, chunk, FLUFF sw merino, handspun, kitchen, knitting, news, prize by barefootrooster. Bookmark the permalink. Love the Thermis–that color looks great on you, and the handknit fabric looks really wonderful. I love the post-semester book clearout. And fabuloso contest haul! Enjoy the break … ah, it is wonderful. Nice swag you got there! Thanks for the Thermis reminder! And oh, I knew you would end up using that handspun for a baby now didn’t I? Enjoy the break. God knows you deserve it! 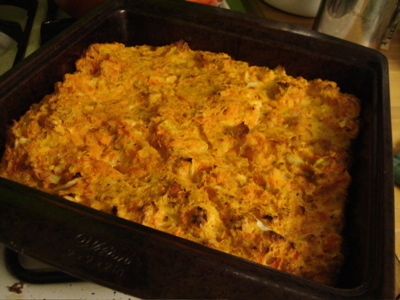 Carrot souffle… intriguing! I’m always so glad to do the end-of-semester book dump. It’s so liberating. I’m happy that Thermis found a welcome home! What a lovely post! Can’t wait to see the baby knits. So cute! What a wonderful collection of gifts! The neck warmer is awesome! Off to queue. The baby knit will be awesome esp with handspun. Congrats to your friends. Congratulations! You made it! 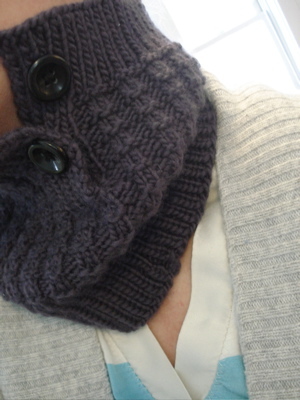 Sounds like you had a GREAT start to your vacation – that cowl looks so yummy and squishy and warm!